This is typical of Rome's defenders— to blame an entire period of political and social history on the theological concerns of a man who stood defiantly against the papacy. It's debatable if things "went downhill" when "Luther turned power over to the princes who leaped at the opportunity to cut ties with the Church and solidify their own." I'm sure from this defender of Rome's perspective, the loss of social and religious power of the Roman church is negative. While he was influential, Luther was not the Emperor, nor did he have any legal authority to turn "power" over to any of the German princes. The Reformation was a complex series of events that can't be so easily pigeonholed as this CARM Roman Catholic did. It wasn't as if all was well with the empire until Luther came along and "turned power over to the princes." There were political power struggles with the papacy and empire long before Luther came on the scene. This defender of Rome would do well to study "centralization," or perhaps read the book he (?) claims to have (Durant). This would be enough of a response, but along with the point about Luther was a quote from Melanchthon. Tracking down Melanchthon quotes isn't as easy as finding the contexts of Luther's words. Below you'll see the tedious detail that one must at times go through because of the sloppy work of Rome's cyber-apologists. Here's the quick version: The person from CARM cut-and-pasted a Melanchthon quote taken from an anti-Reformation web page. That web page took the quote from a secondary source that had the quote on two separate pages. That secondary source took the quote(s) from another secondary source in which the quote is from two different volumes. Part of the quote from one of these volumes isn't even the direct words of Melanchthon. Conclusion: the quote is bogus. The quote as presented is a typical method of citation by Rome's defenders: the creation of a single quote from two different pages, taken from a secondary source, and that secondary source took the quotes from a secondary source (Janssen). This again, displays Rome's apologists at their best. As we'll see below, part of this quote isn't even a direct citation of Melanchthon. 439: the city were administering the Lord's Supper in the Lutheran mode. Augsburg was so fervently Protestant that when Campeggio came there as papal legate the populace dubbed hirn Antichrist (1524). Most of Strasbourg acccpted the new theology from Wolfgang Fabricius Capito (1523), and Martin Bucer, who succeeded him there, also converted Ulm. In Nuremberg great business leaders like Lazarus Spengler and Hieronymus Baumgärtner won the city coündil to the Lutheran creed (1526); the Sebalduskirähe and the Lorenzkirche transformed their ritual accordingly, while keeping their Catholic art. 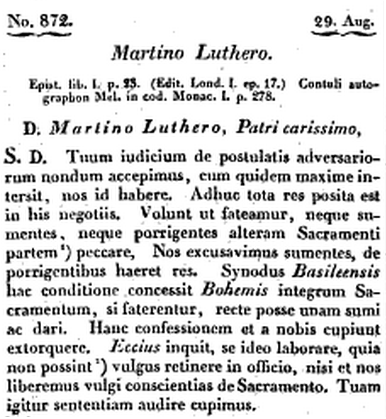 In Brunswick the writings of Luther were widely circulated; his hymns were publicly Sung; his version of the New Testament was so earnestly studied that when a priest misquoted it he was corrected by the congregation; finally the city council ordered all clergymen to preach only what could be found in the Scriptures, to baptize in German, and to serve the sacrament in both forms (1528). By 1530 the new faith had won Hamburg, Bremen, Rostock, Lübeck, Stralsund, Danzig, Dorpat, Riga, Reval, and almost all the Imperial cities of Swabia. Iconoclastic riots broke out in Augsburg, Hamburg, Brunswick, Stralsund. Probab!y some of this violence was a reaction against the ecclesiastical use of statues and paintings to inculcate ridiculous and lucrative legends. The princes, gladly adopting Roman law— which made the secular ruler omnipotent as delegate of the "sovereign people"—saw in Protestantism a religion that not only exalted the state but obeyed it; now they could be spiritual as well as temporal lords, and all the wealth of the Church could be theirs to administer or enjoy. John the Steadfast, who succeeded Frederick the Wise as Elector of Saxony (1525); definitely accepted the Lutheran faith, which Frederick had never done; and when John died (1532) his son John Frederick kept Electoral Saxony firmly Protestant. Philip the Magnanimous, Landgrave of Hesse, formed with John the League of Gotha and Törgau (1526) to protect and extend Lutheranism. Other princes fell in line: Ernest of Lüneburg, Otto and Francis of Brunswick-Lüneburg, Henry of Mecklenburg, Ulrich of Württemberg. Albert of Prussia, Grand Master of the Teutonic Knights, following Luther's advice, abandoned his monastic vows, married, secularized the lands of his order, and made himself Duke of Prussia (1525). Luther saw himself, apparently by the mere force of his personality and eloquence, winning half of Germany. 2. CF. Camb. Mod. Hy, II, 159. Before addressing the bogus cyberspace construction of the Melanchthon quote in question, was Melanchthon lamenting the outcome of the Reformation? Durant does say Melanchthon "mourned" in regard to the first sentence in the quote. Of the second sentence in the quote this author says that Melanchthon "complained," as does this author. Even Dave Hunt checked in saying that Melanchthon "sadly declared..." (No, I don't trust Mr. Hunt either). Why quibble over one word? 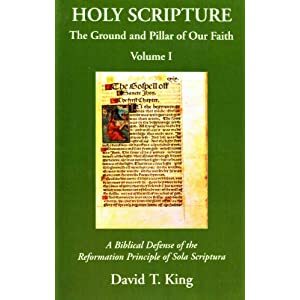 Rome's defenders have a popular notion that the Reformers were saddened by the Reformation at best, or at worst regretted it and their role in reform. From the actual primary source from which Melanchthon's words were taken, it doesn't appear to me to be either mourning or lamenting, but rather frustration during the proceedings of the complicated Diet of Augsburg (1530). One thing though is certain, neither Melanchthon or Luther (or Calvin and Zwingli for that matter) regretted the reform of the church. They were not gleefully ecstatic over every facet of change brought on by the reform movement, but they certainly were not longing for the days previous to their reform work. It would not surprise me to discover that Will Durant had actually never read the primary sources for Melanchthon's words. His footnotes are to a polemical Roman Catholic source, Johannes Janssen, not the primary sources for Melanchthon's words. Janssen's work belongs to the period of destructive criticism of Luther and the Reformation. Janssen viewed Luther and the Reformation as destroying German culture and piety (see, Gregory Sobolewski, Martin Luther: Roman Catholic Prophet, p. 22-23). Janssen's bias does not mean he didn't record the facts correctly. One simply needs to keep in mind the framework an author like Janssen puts his facts into. 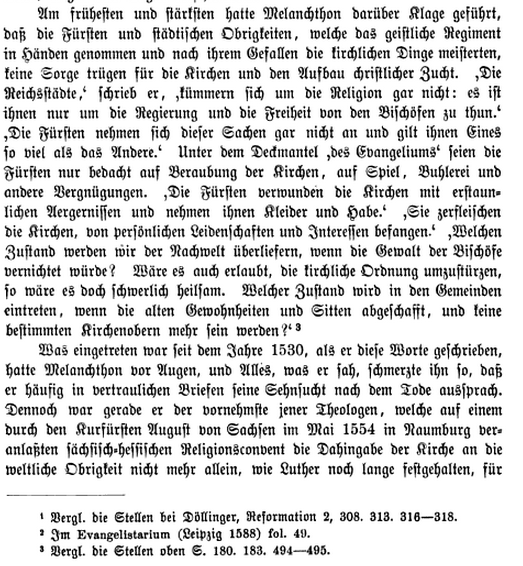 The quote in question is from two different pages in two different volumes of Janssen's History of the German People. Notice in the second citation below that "Under cover of the Gospel the princes were only intent on the plunder of the churches" are not the words of Melanchthon proper, but are probably Janssen's description of what Melanchthon is purported to have said. 1. 'Maxime oderunt illam dominationem [of the bishops] civitates imperii. De doctrina religionis nihil laborant; tantum de regno ct libertate sunt solliciti' (letter to Luther in the Corp. Reform. ii. 328). The last sentence in the paragraph in question does provide a reference: "vergl die stellen oben s 180. 183. 494-495." These are references to previous pages in Janssen's book. Page 180 refers to the English page here; 183, here. 494, here; 495, here. After looking over these pages, still missing is any actual reference to Janssen's description of Melanchthon's words, "Under cover of the Gospel the princes were only intent on the plunder of the churches, on gambling, drinking, and other degrading pursuits." One will notice there's nothing in this short letter that says, "Under cover of the Gospel the princes were only intent on the plunder of the churches, on gambling, drinking, and other degrading pursuits." But perhaps Janssen is summarizing Melanchthon. He's not directly citing Melanchthon as Rome's cyber-defenders say. Where is it from? Janssen doesn't say. It's probably from another 1530 letter related to Melanchthon's involvement at Ausburg. Yes, tracking all this down took some time. If "to be deep in history is to cease being Protestant," I guess Rome's defenders must have a different notion as to what "deep into history" actually means. For them, it must mean creating bogus quotes. I welcome Rome's cyber-defenders to take these bibliographical facts above and figure out exactly what Melanchthon said and where he said it. I've done a lot of the work for you already. Till then, would you folks please document your historical arguments better? Quoting a secondary source who quotes a secondary source only serves to obfuscate whatever points you think you're making. Interestingly, the exact form of the questionable Melanchthon quote was published in this book: Protestantism: Critical Reflections of an Ecumenical Catholic (2007), p. 96. This book includes the quote under the heading of what Melanchthon was purported to have said in 1545. How did the author determine the year was 1545 for these words from Melanchthon? The post gave a quick response to the original comment cited on the CARM forums. 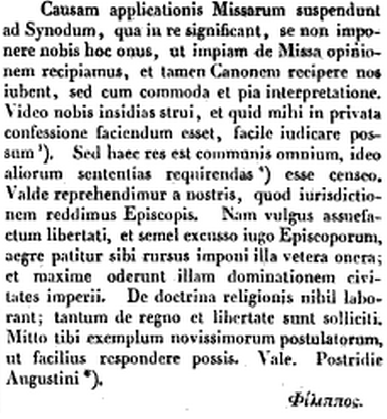 The post then described what I had to go through to check the Melanchthon quote as cited on the CARM forums. This would not be the first time Rome's defenders have done such poor work in documentation sending me on long research excursions. By the way, the quote you seem to be basing your post on is from Will Durant, right? Are you questioning Durant or a cyber defender of Rome? The post is not that cryptic. It begins by showing that the quote came from a cyber-defender of Rome, who took it from two different pages in Durant's book, and Durant actually took the words of Melanchthon from Janssen's book. All parties are guilty, but the most guilty are the people who introduce bogus quotes into cyber space without checking them first. Mr. Swan, Should I assume that you will excoriate Protestant bloggers who engage in the same sort of research when they misquote a Pope on your website or is your criticism one-sided? Should we attribute any of the blame to you since you exercise editorial control over the material posted here? I would note that these are not rhetorical questions. Can you address any misquotes that James Swan has done? I was sort of curious about this too, but only mildly. I would be interested in seeing misquotes from Protestants, especially misquotes that didn't originate from "Roman Catholicism" by Loraine Boettner. But to the point, James still has demonstrated many times on this blog now how poor of a job many Roman Catholics do in citing sources. Is it so bad for the Roman Catholic that they must build straw man arguments like this one "quoting" Melanchthon to "prove" that the Reformation was a mistake? I need to hire a proof reader! Hi zipper778, I do not read BA as much as I used to so I can not come up with one that Mr. Swan made off the top of my head. I am aware of times that other folks who post articles on his blog have and I have never seen him criticize those folks for their use of secondary sources when shown to be inaccurate. As for the other question you asked, I do not like straw man arguments regardless of who makes them. It distorts the truth and unnecessarily prevents meaningful discussion. As for the particular quote, before the argument becomes a fallacious one as opposed to a mere case of mis-reliance on a secondary source, one would need to do a lot more than show that the quote was misquoted. One would have to also show that the mis-attributed quote does not fairly reflect Melanchthon's view before the argument can properly be called a "straw-man" argument. Mr. Swan can show that the quote is wrong, but can he show that Melanchthon did not hold the view being asserted? That is the real question I would be interested in having answered and one that would be more edifying than pointing out that apologists, Catholic and Protestant, need to sit down and formulate a standard for internet research like there is for college dissertations. You should not assume I will "excoriate Protestant bloggers" "when they misquote a Pope" here or anywhere, because my main area of interest has been looking up Luther & Reformation quotes. While there are more examples from Rome's defenders of botched Reformation-related quotes, I'm not all that picky, so if you go through my blog, you'll find that I do look into quotes put forth by non-defenders of Rome as well. Should we attribute any of the blame to you since you exercise editorial control over the material posted here? I'm not exactly sure I understand your point. If you mean that I should take the blame for some Protestant leaving an incorrect comment here, well, that's a bit silly. Now, I don't think every defender of Rome is poor with sources. There is such a thing as Roman Catholic scholarship. If you search through this blog, it's easy to document that there are some Roman Catholic writers I hold in high regard. Can you address any misquotes that James Swan has done? I've found errors in my own posts, usually spelling, or an error in documentation. I fix them as I find them. Of course, some people will argue that I've interpreted a context incorrectly- that's a bit different. Quoting secondary sources can get anyone in trouble (even me)- Especially if you make up a quote from two different pages in a book that is itself using a secondary source. "I do not like straw man arguments regardless of who makes them. It distorts the truth and unnecessarily prevents meaningful discussion." I think that's very fair and I appreciate that. "As for the particular quote, before the argument becomes a fallacious one as opposed to a mere case of mis-reliance on a secondary source, one would need to do a lot more than show that the quote was misquoted. One would have to also show that the mis-attributed quote does not fairly reflect Melanchthon's view before the argument can properly be called a "straw-man" argument." I would think that it should be obvious by asking, did Melanchthon recant? If he did, there's a case to be made there. If he didn't, then it should be obvious that this "quote" is being used to make a straw man argument. That there really is no basis for such an argument, except by way of a bad quote. Thank you James for being honest in saying that you aren't going to hunt for Protestant misquotes. If that's what you want to do, you obviously have that right here. Keep in mind, that I have a particular area of interest. : Reformation studies. If someone posting an entry here on my blog were to say "Luther said X" and it was inaccurate, there's a good chance I'd catch it and correct it. Those are good points Paul. In regard to this entry, notice that the beginning of the entry focused on the polemical points made by a defender of Rome on the CARM forums, and the tenor of those CARM points runs through my blog post. 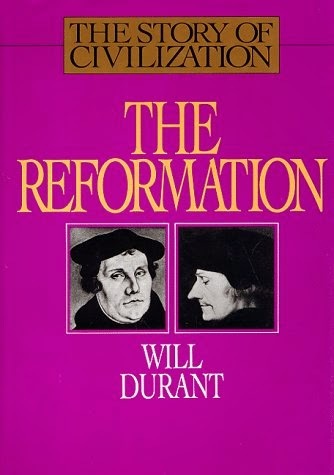 Under the section on Durant, I addressed the CARM person's notion that Melanchthon "lamented." I think a careful reading of my post demonstrates that the CARM person did make a "strawman" argument. I actually did not plan on doing the entire blog entry as it came out. I thought I would just quickly address the CARM comment. In doing so, I looked up his Melanchthon quote, and then I realized that the quote was bogus. I actually knew very little about Luther and the Reformers, and then I began interacting with Roman Catholics on discussion boards. I just started looking the quotes up, and I was amazed at how shoddy the quotes were- either not matching the intent of the context, or put together like Frankenstein's monster. Someone recently commented (perhaps it was you) something to the effect that the way I look up these quotes is like a "giant puzzle." I thought about this comment a lot during the week. Yes, looking up these quotes are like a puzzle. Some of them take hours, and it is like trying to solve something. Some of them I have in draft, and they just sit there because I reached dead ends. All this to say that on some level, I enjoy doing it because it is like a puzzle. Ah, OK Paul, I think I understand your point from your FB comments: they indicate that because I don't scrutinize everything posted here in the past in a Talmudic way, then I'm some sort of hypocrite. You say you're going to post something from this blog John Bugay wrote (perhaps it was he you mean by the word, "minion"?- how nice). Keep in mind, while John and I are friends, we did disagree on my blog some years back in regard to the posting of a quote he used from Pope Benedict. I don't know if the discussion is still visible on the blog or not, I'm sure your "minions" have it saved somewhere, so be careful not to waste your time. It was no secret either then or now that we disagreed. John has done some great work, but this doesn't mean that I approve of everything he wrote on this blog- nor does it mean he approves of everything I write on this blog. Once again, I refer you to my area of interest: Reformation studies. I don't police the Internet or my own blog looking for every mis-citation made. If though, those posting to my blog mis-cite Calvin, Luther, etc. that would be something I'd be interested in, and I think it would be a good exercise for you to find one of my past or current co-bloggers mis-citing Luther and whether or not I caught it. ...currently having trouble with trolls, and my life will not be tethered to a computer, so unfortunately, comments will now have to go to moderation first. Hi Mr. Swan, I forget that everything is read with cynical eye. A minion is a loyal servant, stalwart, lackey, vicar, or compatriot usually denoting that they are of lesser status or authority that the personage they are associated with. (Or of more recent usage, one of those funny, little yellow guys in the Despicable Me franchise that I really enjoy). Too true, n it is confused with denizen or or hatchet man, or in apologetic circles, with Romanist or papist. However, I was not using it as a pejorative, but to indicate their loyalty to you and your cause. I guess I read too much Walter Scott and Howard Pyle for my own good. I have also been called a minion of the- apologist-who-may-not-be-mentioned I will be mindful that some give that term a more sinister meaning. Thanks for the clarification on your use of the term, "minion." I accept your intended use of the term, however, I don't recall ever hearing the term used in any way other than derogatorily. I sent off an e-mail to John Bugay letting him know that you may be posting something he wrote in order to show that I'm causing "real spiritual harm to those who do not yet have the acuity and theological formation to test the accuracy" of my "assertions" against [your] faith." Hi Mr. Swan, I have addressed Mr. Bugay's misuse of a quote of Pope Benedict XVI taken out of context a long time ago. the article I am working on concerning a quote that appeared on your blog much more recently which was used in a post by one of the other folks who frequent here. I will definitely link to the article and give you a head's up when it is posted. the article I am working on concerning a quote that appeared on your blog much more recently which was used in a post by one of the other folks who frequent here. I will definitely link to the article and give you a head's up when it is posted. Once again, I'm going to caution you that to be consistent, you should locate something "one of the other folks who frequent here" posted in regard to Luther and the Reformers, and if it was from a secondary source, and if the quote used was put together in the same sort of bogus way of taking two sentences from two different pages from a secondary source which took the quote from a secondary source. Then, notice if I commented on it, or even saw it. Keep in mind as well, I didn't set out to find this recent bogus Melanchthon quote. Someone on CARM was dealing with it and referred the person using it to my blog. I am still active on CARM, so I tend to see when I'm mentioned in a thread (which I was, a few times). I was going to post a simple response to the person on CARM, and then when I went to check the quote, it became obvious that whoever put it together didn't check the facts, or even care that the quote was from two different pages in Durant. Why in the world would someone take two sentences from two different pages, without even checking it? Keep in mind as well my response in this blog post was to a person on CARM and his interpretation of Melanchthon. It was only secondary that the I discovered the Melanchthon quote was bogus. I think I demonstrated that the CARM person used a bogus quote and not in accord with the partial context. "I am still convinced that the Luther quote, which interestingly mirrors Melanchthon's sentiment, that we chased after came from one of Luther's non-English translated works given how Cochlaeus used it while Luther was alive and no one corrected him on it, no doubt even if it was not accurate, it accurately reflected Luther's views on councils." This is one of the big points isn't it? Why use a polemical quote if you have no idea what the actual context says? You can claim there's some sort of mystery untranslated Luther treatise Cochlaeus had, but we today have a lot more than Cochlaeus did. He had the popular Luther writings (we have those as well), I find it unlikely that there's another treatise on a grassy knoll somewhere. You say that "no one corrected Cochlaeus" on it. Keep in mind, Luther did not respond to everything written about him. If I recall, Luther only wrote one (or maybe two) specific treatises against Cochlaeus, I don't recall exactly, but I don't think it was more than one or two. Yes, Luther mentioned Cochlaeus throughout his writings, but it appears to me he didn't take him all too seriously after awhile. Paul Hoffer, if you are going to address me, or something I have written of which you disapprove, you should address me directly, and not talk behind my back. I am easy to find. John Bugay said...Paul Hoffer, if you are going to address me, or something I have written of which you disapprove, you should address me directly, and not talk behind my back. I am easy to find.
" I am working on pertaining to a quote that one of Mr. Swan's minions made on his blog that a pope supposedly made. I will be sure to link to this as an example of the kind of hypocrisy that is practiced at BA." "I guess the $64 question is whether he actually believes what he wrote about people using secondary resources for their research or is it just when Catholic apologists do it." This is actually fairly simple to answer, so if there's $64 coming my way, I'd like to have it: I use secondary sources all the time. On the other hand, I don't recall creating a Luther quote from two separate pages in a secondary source which took the words of Luther from a secondary source in which the quote is in two different volumes. I've even used a number of secondary sources in citing Luther. That would be obvious from a simple search of the blog. What I try to do though is make sure the quote is not bogus- like creating a quote from two different pages in a secondary source which took the quote from two different volumes of a secondary source. In other words, for the $64 that's now owed to me: use secondary sources, but use caution.